In director Rob Letterman’s live-action Pokémon film, Reynolds voices an adorable yellow Pikachu that only Justice Smith’s (“The Get Down,” “Jurassic World: The Fallen Kingdom”) Tim Goodman, who once aspired to be a Pokémon trainer, can understand. In the trailer, Reynolds’ Pikachu meets Tim, who appears to be in the midst of a significant life and professional change. They connect, come to terms with one another and help each other on a quest for Tim’s dad. The film features a mix of human actors and CGI Pokémon. It’s a world where people collect Pokémon to do battle, but Tim comes across Reynolds’ intelligent Pikachu, who instead seeks to be a detective. “Detective Pikachu” comes after the phenomenal success of the augmented reality mobile game Pokémon GO, based on the popular the Japanese TV series, trading cards and video games. The film, which was produced by Legendary Entertainment, moved to Warner Bros. in July from Universal. The film, which also stars Bill Nighy, Kathryn Newton, Suki Waterhouse, Ken Watanabe and Rita Ora, is expected to hit theaters in May 2019. Do you not get the hysteria over "Pokemon GO"? We got your back. As you click through this gallery of memes, we'll explain what they mean and why they speak to the popularity of the game as a social and pop culture event. Because the appeal of "Pokemon GO" is as much in talking about it as it is actually playing it. First and foremost, "Pokemon GO" is about taking funny pictures of Pokemon doing things in the very real place you are in. This is a great example of that: set some booze next to a Pokemon and act like its there to hang out and party with you. In a lot of places, "Pokemon GO" has given players a surprising sense of community -- at happy hour on Sunday, for example, my friends and I met several random people just because they were also playing. "Pokemon GO" players can spot each other from a mile away. In our incessant search for Pokemon, we often end up in strange places. No, we don't usually break into people's homes. But the point is just you never really know where "Pokemon GO" will take you. Taking the "look at the weird places we go for Pokemon" in a more sitcom-ish direction, this person accidentally ends up in a job interview. A lot of couch potatoes (like me) downloaded "Pokemon GO" and spent several days in a row walking long distances -- and then we got home and found our legs were real sore because we don't usually walk eight miles in a day. I guess it's good for us, probably. While it may seem as if everyone is head over heels for "Pokemon GO," there are plenty of party poopers out there who just want everybody to shut up about it. The cop in this meme represents those people. However, most police officers depicted in "Pokemon GO" memes are just as enthusiastic about playing as everyone else. You're really supposed to play "Pokemon GO" on foot, but it's certainly possible to catch Pokemon while in the car. But "Pokemon GO" while driving is like texting while driving times a million. Don't do it! Since you obviously shouldn't do "Pokemon GO" while driving, you'll definitely want to get your passengers involved. But if they refuse to catch Pokemon for you, that's a major breach of etiquette. A cautionary tale of how it might go for you if you do decide to Pokemon while driving despite the risks. The police department in Sarasota, Fla., posted this PSA meme on its Facebook page -- notably, it features a Pokemon photoshopped into a picture of a police car, rather than using a picture taken in the "Pokemon GO" app, making it a legit dad meme. The darker side of "Pokemon GO" memes is all about taking advantage of players' fervent desire to catch Pokemon in order to commit crimes. In real life, this may or may not actually be happening already. "Pokemon GO" was first released on July 6, but only in Australia and New Zealand -- its launch has been a slow rollout across the globe. So while it was taking the U.S. by storm over the weekend, a lot of places still didn't have it, including the United Kingdom. Here's a Pokemon fan looking longingly out the window, demonstrating the pain of the wait for the app to release in the UK while everybody in America was out having fun over the week. A popular meme type in general is where a girl wants a boy to come over to hook up, but he doesn't want to because of whatever nerd activity he's currently involved with (usually video games). But, in a twist, the girl also is doing that same nerd thing, and the boy comes running. Demonstrating just how obsessed some players are, this meme shows a fan continuing to play even while pulled over for a traffic violation. The pinnacle of pop culture is this melding of "Breaking Bad" with "Pokemon GO." When you reach level 5 in the game, you join one of three teams, which you'll represent when you make your Pokemon fight other Pokemon at gyms. Which means technically a lot of these other folks walking around are your enemies. Some of the best funny "Pokemon GO" pictures are of the really big ones. Onyx are also good for this. It's probably a good thing the launch rollout for "Pokemon GO" has been kinda slow -- the app requires you to be connected online for it to work, and over the weekend there were times when it would kick players out every few minutes, or would prevent anyone from logging in as the servers powering it were overloaded by the massive number of people trying to play at once -- as we see in this meme. If you're the sort of person who walked around a lot before you started playing "Pokemon GO," you might have noticed that a trip you take every day suddenly takes twice as long or more as you constantly stray from the path looking for some rare Pokemon the app tells you is nearby. There's always been a pretty stark generational divide over Pokemon, as one of the defining "get off my lawn" entertainment properties geared toward children back in the '90s and aughts. So for a lot of millennials, it's amusing to talk to mom and dad about it, because they tend to be pretty baffled by it. There are a lot of variations on this "pointing a gun at a Pokemon" meme. Yet another example of the sort of goofy and dumb pictures you can do with "Pokemon GO" -- thought we'd recommend not doing this in public. At the risk of beating a dead horse with these "exaggeration of how obsessed people are with 'Pokemon GO'" memes, here's a commercial airline pilot going off his flightplan to chase a Pokemon. 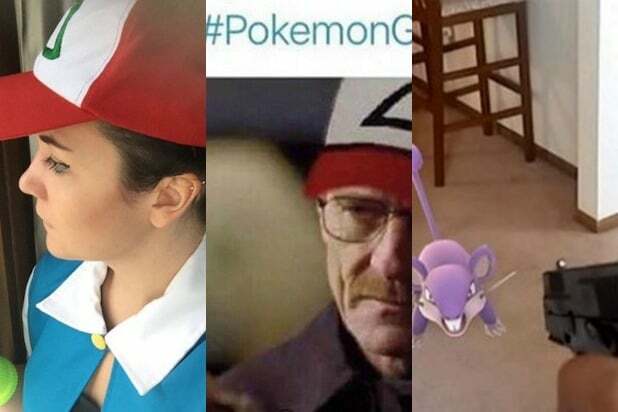 We hope this selection of good memes has helped explain the phenomenon that is "Pokemon GO." But if you want to know more, we've also got a more traditional explainer that you can check out.